In 1991, Vladimir Yakunin, a Soviet diplomat and KGB officer, returned from his posting in New York to a country that no longer existed. The state that he had served for all his adult life had been dissolved, the values he knew abandoned. Millions of his compatriots suffered as their savings disappeared and their previously secure existences were threatened by an unholy combination of criminality, corruption and chaos. Others thrived amid the opportunities offered in the new polity, and a battle began over the direction the fledgling state should take. While something resembling stability was won in the early 2000s, today Russia’s future remains unresolved; its governing class divided. 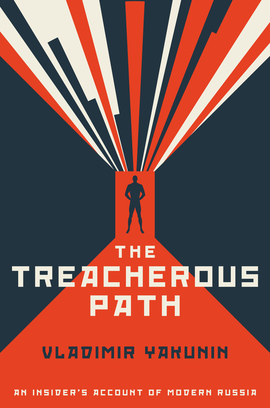 The Treacherous Path is Yakunin’s account of his own experiences on the front line of Russia’s implosion and eventual resurgence, and of a career – as an intelligence officer, a government minister and for ten years the CEO of Russia’s largest company – that has taken him from the furthest corners of this incomprehensibly vast and complex nation to the Kremlin’s corridors. Tackling topics as diverse as terrorism, government intrigue and the reality of doing business in Russia, and offering unparalleled insights into the post-Soviet mindset, this is the first time that a figure with Yakunin’s background has talked so openly and frankly about his country. Yakunin has produced a multidimensional memoir and a portrait of contemporary Russia that features many more shades of gray than the simplistic versions common in Western media. A vivid and sharp account of a major page of Russian history, aiming at building bridges between cultures. It is not often one gets a deep insight from a Kremlin insider who has remained independent of the Kremlin. Yakunin has been a KGB man, a Russian Minister and boss of Russian Railways. He has been a colleague of Putin but is a candid one. He is well worth reading. Vladimir Yakunin, a former Putin insider and loyalist, has broken the Kremlin code of silence and gives an incomparable lowdown on life and politics at the top. Having worked with Vladimir Yakunin at the UIC, I deeply appreciate this honest and important testimony of his long career in business and politics. The Treacherous Path is also a transmission of shared human values; the clear and open vision of an Honnête Homme – a railwayman hitching his wagon to a star. Vladimir Yakunin’s autobiography provides a prism through which the reader can better understand the former Soviet Union and present-day Russia. His account of the eventful recent history might not be agreeable to everyone but it is valuable reading thanks to his perspectives as an official, businessman and professor. A must-read if you truly want to comprehend the most recent history of Russia and its role as a bridge between East and West. Vladimir Ivanovich, who has passionately served his country in important leadership roles, provides a personal recollection of key episodes explained with great insight, candour and conviction. As a political insider, he invites you to overcome ideology and explore new forms of dialogue between the world’s leading nations and civilisations.